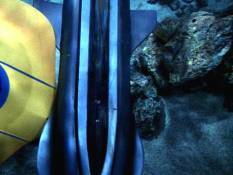 Kowalski learns trapped diver is his brother. 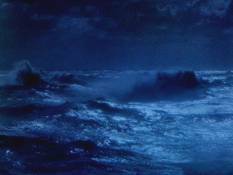 As a storm rages on the surface, Seaview attempts to rescue a diver trapped on the ocean floor near a sunken atomic sub (the trapped man turns out to be Kowalski's brother, Stan). Crane effects the rescue and as they're leaving the area, two homing torpedoes from the wrecked sub misfire and explode near Seaview, inflicting heavy damage and sending her to the bottom. Things don't look good. The reactor is down, it'll take a week to repair air revitalization, and Seaview's starting to crumple under the pressure. They have about 2 hours of residual air left, not to mention that the nearby wrecked atomic sub is showing signs it's about to explode. As temporary repairs are rigged, Stan lets anyone else who will listen know that he's freaked out to have been saved just so he can die again. Doc explains that the experience may easily have left Stan in a state of shock -- a changed man. Nelson attempts to use the Flying Sub to get to the surface, but a control component fails and he crashes to the bottom. 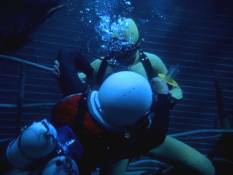 Stan refuses to use his deep-dive suit to save Nelson, but is cajoled into talking Crane through the process. In spite of peril and mishap, Crane succeeds, but sand clogs FS-1's exhaust vents and Crane must try a tricky laser shot to loosen the sand. The scary shot works, but the other downed sub is jolted loose from its cliff-side resting place and looks as if it's going to ram the already weakened Seaview. Nelson manages to ram the sub to veer it off course, but must return to Seaview when the Flying Sub's engines act up. 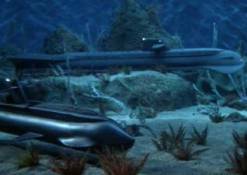 Nelson get's runaway sub in sights. 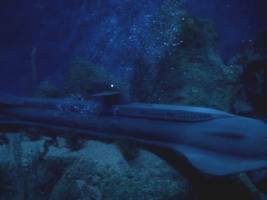 Missing Seaview, rogue sub comes to rest. The Admiral then opts to use the only piece of equipment on Seaview that's still working (Stan Kowalski's suit) to try to get to the surface to alert Navy Rescue. In a confrontation with Stan, Nelson tries to make the man understand why he's going risk all to get to the surface. 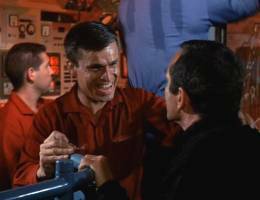 The suit is launched and when Crane and Sharkey come running to the missile room, Stan is nowhere to be found, and shortly the suit is seen to explode as the Admiral makes his way to the surface. Things are looking mighty bleak when Nelson descends the spiral staircase in the observation nose and explains that Stan knocked him out and made the trip himself. 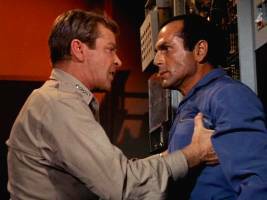 A desperate Nelson confronts Stan Kowalkski. It's not long before a diving bell comes to the rescue and out pops Stan, explaining that it was only one of the suit's two tanks that exploded. The crew all manages to escape Seaview just before the nearby wrecked atomic sub explodes. Nelson immediately starts planning a salvage operation to retrieve and restore Seaview. Stan immediately volunteers that he'd be just the man to head the team, and Crane sprouts a decidedly unsure look before the camera fades to black. Mark Says: Another "Seaview sinks to the bottom" story, but this suspenseful tale of survival works on several levels, including good characterizations. 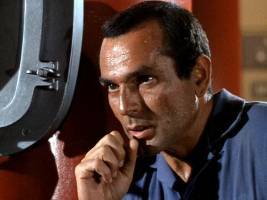 Don Gordon is excellent as Stan Kowalski and brings intensity to the role. 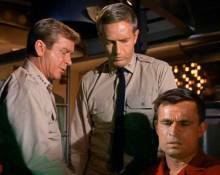 The scene where Stan and Nelson discuss fear and cowardice is probably the last time we see a really earnest, dramatic scene between characters on Voyage. 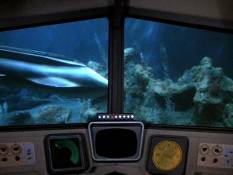 Special effects have that aquarium look, but they're still fun to watch, as is Nelson's desperate effort to reach the surface in the Flying Sub. Mike Says: Upon rewatching this episode recently, I was astounded at how well it plays. The story is riveting and loaded with substance; there is tension in the dialogue. Kowalski is made more real by his reaction to his brother's uncharacteristic cowardice. Nelson displays the kind of moral clarity so prevalent in the black and white shows. My goodness, the darned episode works remarkably well, with motivation, rectitude and logic pushing the doings. 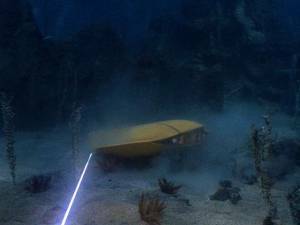 Unfortunately, Irwin Allen's "dry set" policy for later season shows means that the more expensive flooding set-pieces which lent season one's "Submarine Sunk Here" so much immediacy, are missing. The flooding and crumpling of Seaview's structure are for the most part just reported over the intercom, rather than depicted. Scripted by Robert Vincent Wright whose previous efforts for Voyage included the thoughtful "And Five Of Us Are Left," "Graveyard of Fear," and the questionable "The Terrible Toys." Director Gerald Mayer was a veteran of shows such as The Fugitive, Thriller, and Ben Casey.